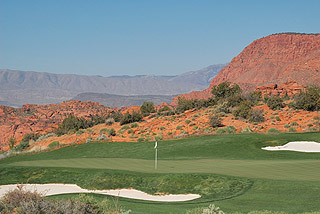 The Ledges of St. George is the newest upscale golf course to be added to the scene of what Two Guys Who Golf considers the most desirable golf destination in the U.S. The Mesquite/St George area is home to some of the most spectacular layouts in the country - with price scales that provide a great value. Casinos in Mesquite and numerous hotel properties in St George afford ample choices for accommodations - and the 40 minute drive between the two areas is extremely scenic! Check out our resorts/accommodations section for recommendations. The Ledges is an awesome golf experience, and one that can be enjoyed by the golfing public for a limited time - as this property is accepting memberships at a steady rate, and will be private in the near future. 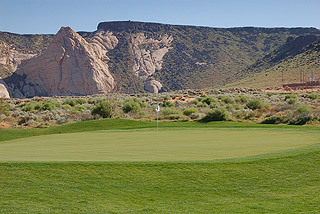 Play it now if you have the opportunity - this is a "destination" golf course - worthy of the drive on its own! The par 72, 7145 yard Matt Dye design opened in late 2005, and on our April 2006 visit was in wonderful shape from tee to green. There was some construction going on with roads and residences being built, but this did not distract from the wonderful environment. Four sets of tee boxes provide golfers with opportunities to play from distances measuring 7145, 6713, 6230 and5674 yards. 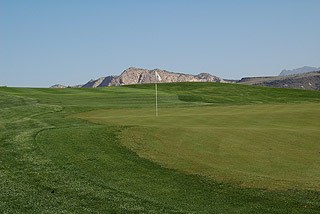 The course had not been rated when we photographed the course, but from our point of view this is a well designed challenge, which can be enjoyed by all levels of players. The front side is a good warm up for an exciting and at times difficult finishing nine. The UpLink GPS mounted on each cart provides useful information as well as exact measurements from tee to pin, and 150 yard stakes on all the par fours and fives also serve as helpful targets. 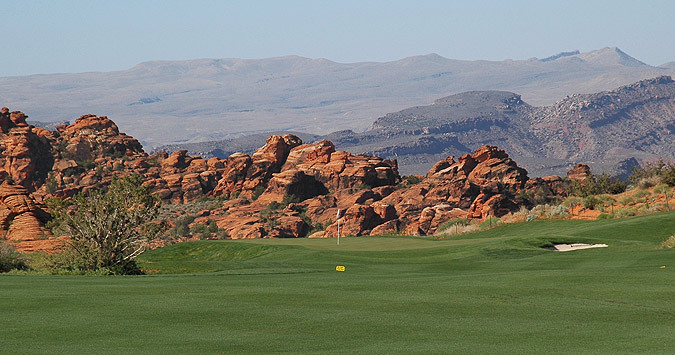 As the photos in this review indicate, the vistas are quite stunning, with some unusual and highly colorful rock formations (including "Rock Fish" - from where the restaurant at Ledges gets its name) framing many of the green complexes. 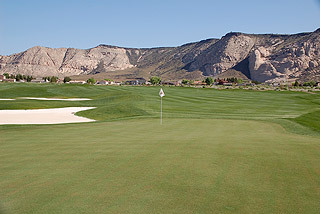 The front nine features a rolling terrain with wide fairways and some mild elevation changes. The back side opens similarly before the topography transforms this into one of the most memorable nine holes we have ever encountered. 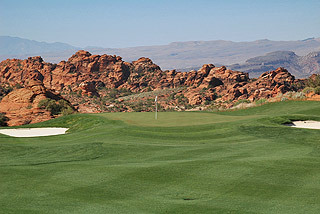 Numbers 14, 15 and 16 are incredible golf holes, featuring canyon backdrops and carries over desert washes and ravines. 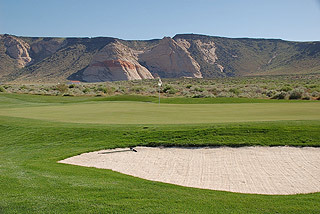 The Green complexes are moderately raised and usually well protected on the sides and behind by sand bunkers. 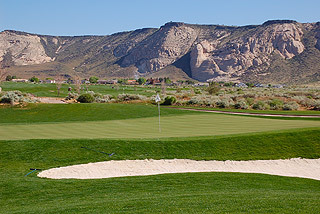 Undulations are mild, but many of the finely manicured and true -rolling putting surfaces have tiers or slopes. Mounding along the fairways and beside the greens is pronounced. 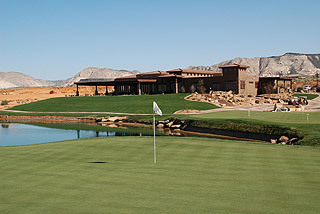 There are over 80 sand bunkers in total, and water comes into play on just two holes. Amenities are being added steadily while construction is ongoing. Eventually members will be privileged to enjoy one of the best private facilities in the area. For now, members and the golfing public will be treated to excellent service and a dramatic, top notch golf experience. The Rock Fish Restaurant/lounge provides a comfortable atmosphere (with lunch menus only, until new road construction is complete) and seating for up to 210 people. There is a wonderfully landscaped outdoor patio, and a nice size pro shop. 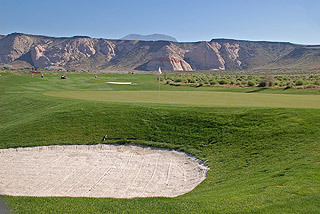 Practice facilities include a targeted grass range, short game area with sand bunker, plus putting and chipping greens. 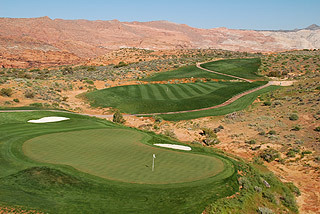 AGAIN - Play The Ledges of St. George soon, as (like the Entrada at Snow Canyon in St George), this course will eventually be available to members only. For more info and a direct link to the properties' own website, visit our page for this course by clicking here.